When it comes to a new roof, one of the biggest decisions the homeowners we work with have to make is whether they prefer metal or asphalt. One of Jay and Deborah’s neighbors recently had a residential metal roofing project completed by us. Admiring the final outcome, they reached out to us to understand more. 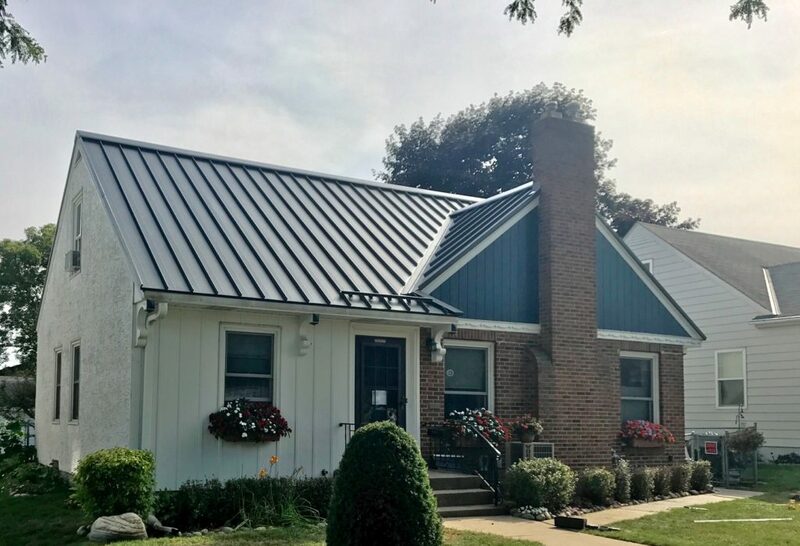 After discussing details like cost of roof replacement and how metal roofing fares in Twin Cities winters, they opted to have their Ramsey county stucco home updated with a new metal roof. 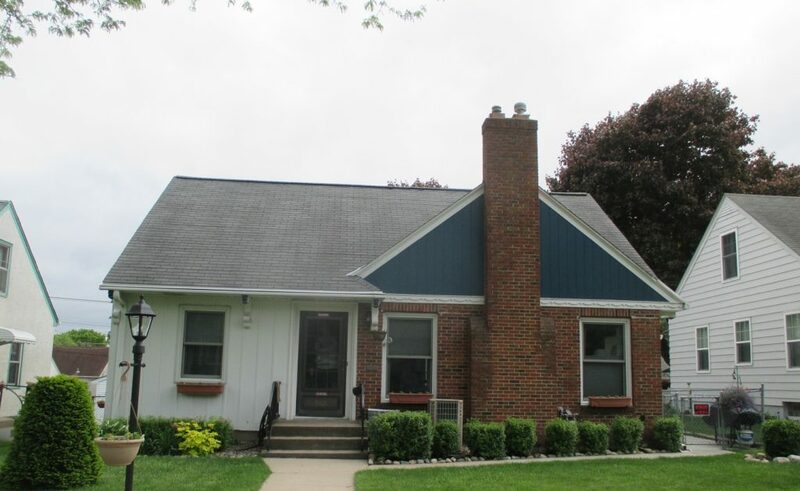 Their previous asphalt roof was a gray hue that played well with the home’s red brick and light gray stucco siding. Keeping with a similar color palette, they selected a charcoal gray metal roof. This color consistently ranks as a top seller with the roof manufacturer. In addition to their beauty, metal roofs win favor with Twin Cities homeowners because they do not warp, curl, split, flake, peel, or burn. Insurance companies recognize their merits and often award discounts to homeowners with metal roofs due to their fire resistance. In order to curtail snow from sliding off the roof and causing injury, snow bars were installed on the section of roof above the front entry. Here’s the roof after the asphalt shingles were torn off. 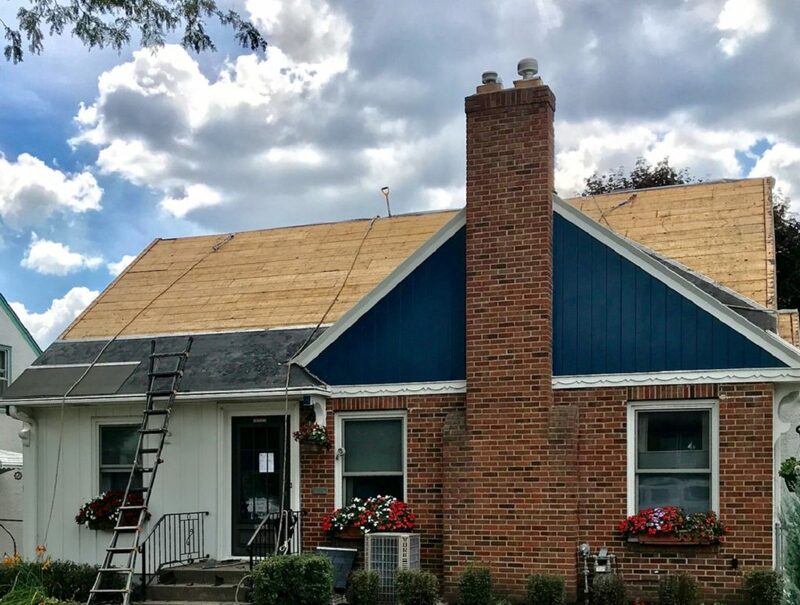 Because roofing and insulation go hand-in-hand, the home’s attic was evaluated and we determined that the inclusion of blown-in fiberglass insulation could improve the home’s energy-efficiency. Here’s how the project turned out! The final component of the project was the installation of LeafGuard® Brand Gutters. Installed in Coal Gray, they are the perfect accompaniment to the new roof and provide the ambiance of crown molding. LeafGuard®’s oversized design was lab-tested to handle 32 inches of rain per hour-over three times the record rainfall ever recorded by the U.S. Weather Bureau. Even better, they’re guaranteed never to clog or we’ll clean them free of charge. "Jobs were done quickly and well." - Linda R.
"Lindus put new siding on my garage. The quality of the work was very good." - Becky H.
"Looks great and came with warranty that transfers with house if I sell." - Mary Jane M.
"LeafGuard® Gutters are awesome! It's one of the best investments I've made for my house." - Ruth A.